Steve Kaiser is a Captain in the US Army Reserves, 492d Civil Affairs Battalion. He completed a successful deployment to Afghanistan as a Civil Affairs Team Leader in December 2008. 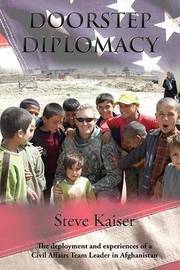 This book offers a first-hand look at Captain Kaiser's experiences in Afghanistan, combining notes and correspondence written during his deployment with more recent reflections to depict the inner workings, successes, and failures of America's new "soft power" policy in Afghanistan. The book also gives a full, vibrant look at the Afghan people and their daily lives. Includes more than 100 photos.